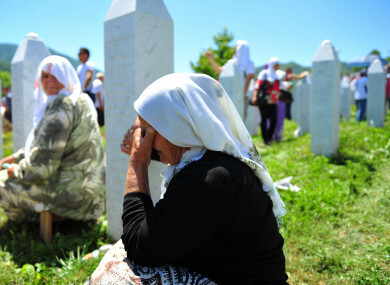 Over 7,000 Bosniaks were murdered by Serb forces in July, 1995 during the Bosnian War. WHEN BERNARD DUNLEAVY visited Bosnia and Herzegovina he travelled to Tuzla, to the city’s UN-run mortuary. Lining the shelves of a warehouse attached to the mortuary, Dunleavy noticed thousands of fertiliser bags. On 11 July 1995, Bosnian Serb general Ratko Mladić entered the town of Srebrenica, a town in the east of the country. As news spread, locals fled into nearby fields and factories. Some 10,000 Bosniak men (Bosnian-Muslim) travelled on foot through forests and mountains. Six days later, just 3,000 arrived in Tuzla. Over the following days, Mladić’s forces systematically separated Muslim men and boys, murdering over 7,000. Some 20,000 people were displaced in an act of ethnic cleansing. Known as the ‘Srebrenica Genocide’, the massacre was the worst instance of mass murder since the Second World War. Having travelled through the region meeting survivors, Sutton-based lawyer Dunleavy is running the Dublin Marathon this Sunday in remembrance of the Bosniak victims. During the Bosnian war, Dunleavy’s friend David Hamilton drove trucks through Bosnia and was in Tuzla in 1995 as fleeing women and children arrived to the city from Srebrenica. Hamilton became involved with an aid agency there and, last year, Dunleavy took him up on his offer to visit the region. “It wasn’t at all what I expected,” he says. After visiting Srebrenica, Dunleavy was “overwhelmed” by what he witnessed, he says. “Everyone is buried in the same graveyard. It just stretches on and on. The extent to which the country is still utterly divided along sectarian lines, the denial of the war crimes that took place was deeply shocking. Dunleavy contacted Remembering Srebrenica, a charity founded in the UK in 2013 aimed at promoting community cohesion and setting up social action projects, and became involved in raising awareness about Srebrenica. Due to the efforts of Bosnian Serb forces, it’s taken over a decade to identify those murdered and buried in mass graves in July 1995. In November 2017, Ratko Mladić was found guilty of genocide, war crimes and crimes against humanity. He was sentenced to life in prison. On Sunday, Dunleavy will join 20,000 participants in this year’s Dublin Marathon on Sunday. “Mostly I want to raise awareness about the massacre. It affects people there every day on a really profound level. People have to bear witness and remember it. Otherwise you can’t do anything about making sure it doesn’t happen again. Email “Dublin lawyer runs marathon in remembrance of 1995 Srebrenica massacre”. Feedback on “Dublin lawyer runs marathon in remembrance of 1995 Srebrenica massacre”.